"I never left this island until I was probably twelve. There was no other world out there." My name is Katherine Christine Cooper Quinn. 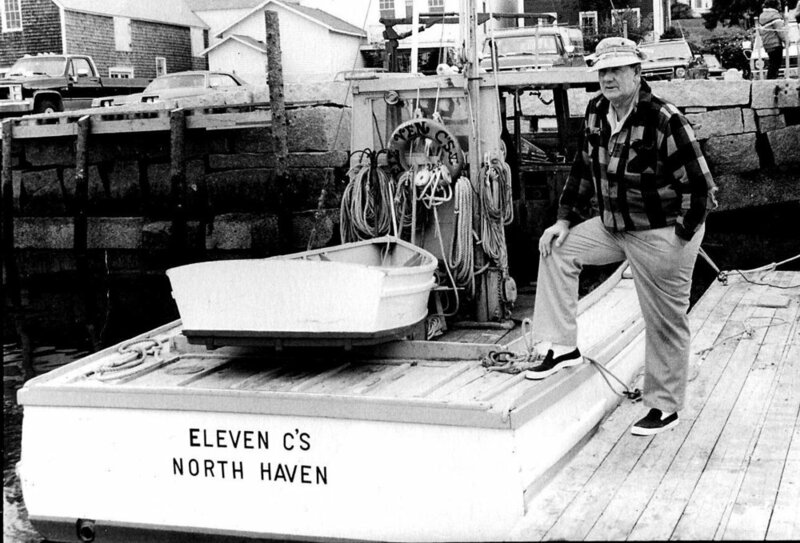 And I was born on North Haven Maine in 1948. August 14th, 1948. My mother had 11 children. I'm number four. We lost one brother awhile back, so now there are ten of us floating around. Leta Can you say them in order? Kate I think I can. All right, we’ve got David, Cheryl, Peter, myself. Then we have Candy, Harold, Becky. Now we’re down to Timmy, Victor, Wendy, Tammy. Leta Was there a moment when you decided that North Haven was the place that you were going to spend the rest of your life? Kate Oh, I think, probably, from the time I was two years old, probably, I knew that. We lived in the farmhouse, which is now the Watson Estate. I just loved it up there. I mean, I was the outdoor kid. I was the berry picker. I was the, you know, the one that really just liked being outside and doing that kind of stuff. We spent a lot of time, I think every day, we were always out. I don't ever remember being in the house that much. I think our mother would kick us out and say, go do something. And so, we–I mean we'd walk around the shorelines. We'd go out into the woods. And course, we had the whole run of the place. So, that whole point up there was our playground, so it was great. We always had this competition. There were three maple trees growing right beside the house and so one of them was taller than the others. So, we always would have this competition of who could get to the top of the maple tree. And see who could get the highest without having to come down. The wind would sway that tree. But once you got up there, man, you could see the whole eastern bay and it was beautiful. The only time we ever went to the village area was in the summer for the Legion Festival, when they had the big parade. We would go downtown that day and see the parade and that was the only time that I ever recall going downtown. The Legion would have a–what they call a three-day festival. They would always put on, in the earlier years, they'd put on minstrel shows in Calderwood Hall. It was like a variety show. So, they'd have songs, they'd have dances, they'd have jokes and all kinds of different things like that. And a lot of the joking would be done in the form of a black person, you know, saying jokes or doing something. So, then the government stepped down on that, so they couldn't do that anymore. So, then they started doing the plays and they'd run that three nights, then they'd have a day of a parade and games, you know, like throw a ball at the bottles and little things like that. And so, it was just a festival. Oh gosh, it was like wow. I mean, we were like scared, but fascinated but, just mesmerized. I mean when you think of how small it is, you wouldn't think that that would be an impact but it really–it was quite a change. It was kind of scary. I mean it was a lot of traffic, a lot of people, and I didn't like people. Well yeah, and of course, back then [there] definitely was a lot of summer people around too. So, we certainly didn't know them. I mean, we might know a few of the kids that we went to school with and that sort of thing but other than that it was like a complete, whole new world. I never left this island until I was probably twelve. I'd never been off the island, other than to go to another island, like on a picnic or something like that. Our father would take us to other islands. There was no other world out there. Good heavens, the village was a big city to me when I was ten years old. Oh, scared to death. Yeah, I had to go over there because my father, he would always buy our school clothes and every year we'd get a new pair of shoes and a–I think one dress and a couple pair of pants and couple of shirts and that was about it. And that was our wardrobe for the year. Well I had big feet and so he'd buy these shoes and they would never fit and never fit and never fit and I'd try to make them fit. And oh goodness, my poor feet hurt so bad. So, one year he brought these shoes and they were just too small. I couldn't wear them. So, he finally decided he'd have to take me over there and get a pair of shoes, have me try them on, instead of him having to take them back and keeping trying to find a pair that would fit. So, that's the first time I ever went on the mainland. At that time, there were a lot of stores, grocery stores and everything right on main street in Rockland. And there was a clothing store and a shoe store. And so, everything was right there. I mean, it wasn't as scary as I thought it would be. But, it was still quite different. You know, the buildings are bigger and the streets were a lot different. There were sidewalks and, oh my gosh, it was like, wow. As I look back on it, I never thought about it much, but I'd say we were probably poverty line. So, definitely poor, I mean, my father was a caretaker for Lockwood’s and then he lobstered on the side. And then, in the wintertime, he would work in the woods pulling wood out and doing stuff like that for people. So, it was not easy. We weren't starving to death. The food wasn't gourmet by any means, but we managed. And I mean, my father would dig clams, he’d go fishing every fall, salt fish down for the winter. I know Tonny Calderwood always brought milk to the house and eggs and things like that. So he would get his eggs and stuff from Tonny Calderwood. No, we did all right. Well, of course, winter was hard. I mean, we lived in an old farm house. We didn't have central heat. We had wood fires. We had two wood stoves. The upstairs was not heated at all, so it was cold. And I can remember my mother hanging clothes out in the wintertime and they'd be frozen and you’d bring them in frozen and set them by the fire and when they thawed out, they were still wet. So what was the sense to hang them out to begin with? I couldn't figure out but she always did. But most of the kids that I went to school with were in the same boat, I mean, it wasn't an easy time out here during the 40s and 50s and even into the 60s it was still kind of tough. And then things kind of started getting a little better, I think. But there was definitely a lot of poverty out here. I'm really not sure, but my own theory is that the summer community saw that if they didn't, kind of, support some things or pay the people on the island to do the work enough to keep them there, then they would have nobody to take care of them when they were here. And I think, that's kind of what brought the scale, the wage scale, up a little bit. And that's my theory. When I was young it was very, very segregated. The native people did not play, I guess [is] one way to say it, play with the summer people. Very, very segregated. Yeah, it was kind of like a caste system, you had your summer people that hired you, and then you were the worker and so you just didn't cross that boundary. We always were, kind of, in awe of them or something. You know, like now, I know kids go down to the Casino, island kids and summer kids, and I think that's wonderful. But when we were growing up, oh my goodness, we did not step foot on the Casino you just didn't do it and that was their private playground and island kids did not enter into it. So, we didn't get to know the summer kids like the kids now do. We’d kind of stand back and know they were there, but we never would really interact with them. I would say, by the time I was between twenty and twenty-five that barrier had started breaking down and then it just kept breaking more and more as the years went by. And people kind of realized that we really aren't so different, you know? Money really isn't the difference between people and I think that was, in my feeling, that's, kind of, when it happened. I think over time the summer community has kind of blended into the year-round community a little more. And I'm saying that they're the ones that have blended in more than they year-round blending into them. And I think, they're acceptance of that year-round community and being willing to, kind of, treat them as almost an equal is a good thing and so I think, in that way, I think the strength of the community is greater. I'd say probably the biggest moment in my life was when I had cancer. And of course, had to go through treatment and all that. And so, the school and the community got together and had this potluck dinner as a fundraiser. But they also put together this quilt that Jean White helped with and everybody signed it and that is my most precious keepsake of anything that I own. It was just beautiful. And that was probably the most amazing thing that I've ever been through. And that just shows what this community can do and will do when someone's in need or someone is hurting.